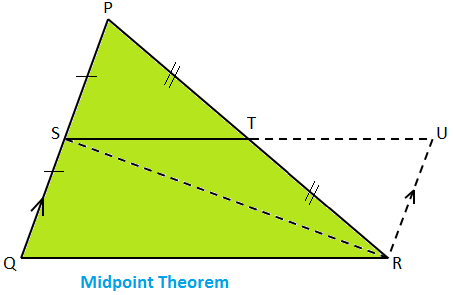 Theorem: The line segment joining the midpoints of two sides of a triangle is parallel to the third side and equal to half of it. 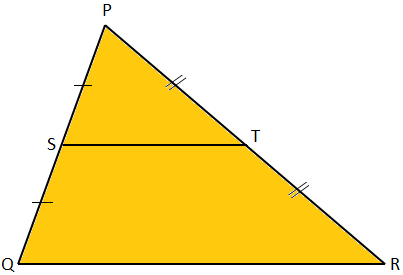 Given: A triangle PQR in which S and T are the midpoint of PQ and PR respectively. Construction: Draw RU ∥ QP such that RU meets ST produced at U. Join SR.
(i) T is the midpoint of PR. 2. By AAS criterion of congruency. 4. S is the midpoint of PQ. 5. Therefore, RU = QS and QS ∥ RU. 5. From statements 3, 4 and construction. 6. In ∆SQR and ∆RUS, ∠QSR = ∠URS, QS = RU. 8. SAS criterion of congruency. 9. CPCTC and statement 3.